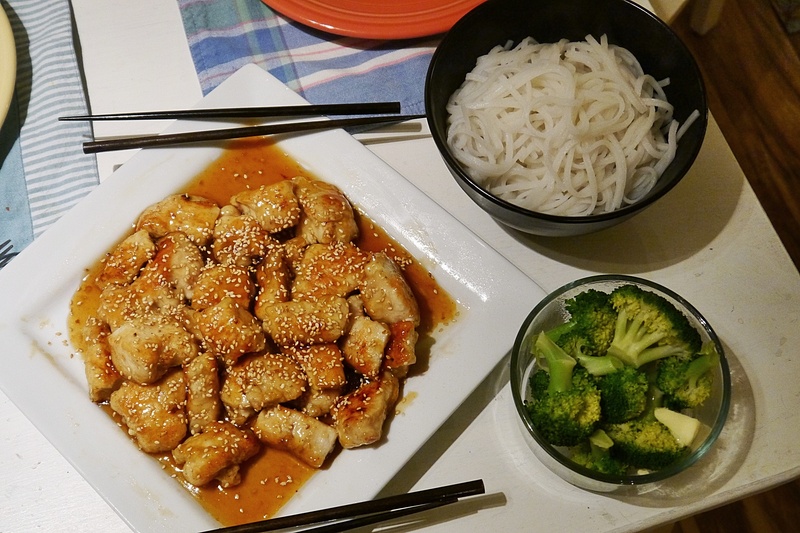 I’m not big on deep frying anything, but I love orange chicken so I wanted to find a way to make it so it was still crisp without all the oil and breading. 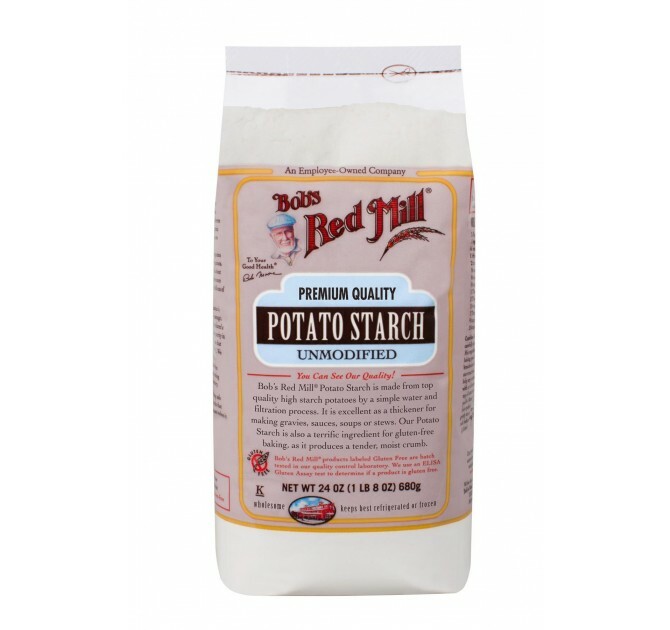 I found the perfect ingredient to produce that result: potato starch. I’ve been using it for a while now and it makes the most perfect Oven Baked Chicken – I’ve been substituting it for the bread crumbs, combining it with crushed rice chex – I’ll post an updated recipe on that technique this week. I thought it might have the same effect on pan frying chicken pieces. It did. Crispy, light and flavorful. Of course top anything with enough orange sauce and I’m there. Add salt and pepper to potato starch. Drizzle a bit of oil over chicken pieces to coat. Dredge in potato starch mixture and move to clean plate. Finish all chicken before cooking. I used to have a wok, but never got the results I wanted from it. Then I heard Ming Tsai discuss how a skillet works better in regular kitchens because a wok really needs a commercial heat source to get it hot enough to cook the way it is designed. Got rid of my wok and use my skillet now. So don’t feel you need a wok to stir-fry things. Heat oil and add onions (whites and green) quickly stir until they have softened (about 1 minutes) and then add chicken pieces – one at a time so they all touch oil/skillet surface. You may have to cook chicken in two batches depending on the size of your pan. Fry until golden on one side, then flip to brown the other side. Then I tossed it around a bit until it was golden on all sides. If you cooked in two batches, remove first batch to clean plate and cook the second batch. Add all chicken back to pan, coat with Orange Sauce and toss until it’s all coated. Let sauce heat through thoroughly over low heat. 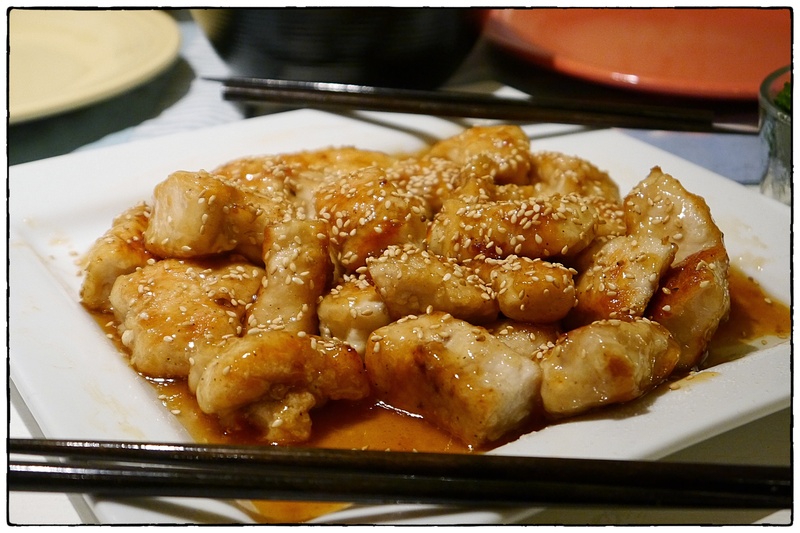 Serve with rice (or noodles), garnish with sesame seeds and onion greens.